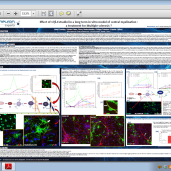 Presentation of the company’s improved in vitro Blood Brain model including primary neurons for Alzheimer’s disease high content screening. Michal Geva, Rebecca Kusko, Holly Soares, Kevin D.Fowler, Tal Birnberg, Steve Barash, Avia Merenlender-Wagner, Tania Fine, Andrew Lysaght, Brian Weiner, Yoonjeong Cha, Sarah Kolitz, Fadi Towfic, Aric Orbach, Ralph Laufer, Ben Zeskind, Iris Grossman and Mickael R. Hayden. 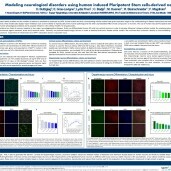 Article – Stromal SLIT2 impacts on pancreatic cancer-associated neural remodeling. Secq V, Leca J, Bressy C, Guillaumond F, Skrobuk P, Nigri J, Lac S, Lavaut MN, Bui TT, Thakur AK, Callizot N, Steinschneider R, Berthezene P, Dusetti N, Ouaissi M, Moutardier V, Calvo E, Bousquet C, Garcia S, Bidaut G, Vasseur S, Iovanna JL, Tomasini R.
Cell Death Dis. 2015 Jan 15;6:e1592. 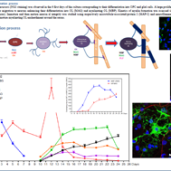 Article – Combining two repurposed drugs as a promising approach for Alzheimer’s disease therapy. Chumakov I, Nabirotchkin S, Cholet N, Milet A, Boucard A, Toulorge D, Pereira Y, Graudens E, Traoré S, Foucquier J, Guedj M, Vial E, Callizot N, Steinschneider R, Maurice T, Bertrand V, Scart-Grès C, Hajj R, Cohen D.
Sci Rep. 2015 Jan 8;5:7608. 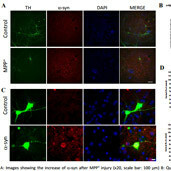 Article – Operational dissection of β-amyloid cytopathic effects on cultured neurons. 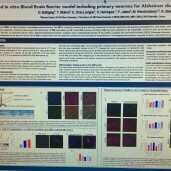 Callizot N, Combes M, Steinschneider R, Poindron P.
J Neurosci Res. 2013 May;91(5):706-16. 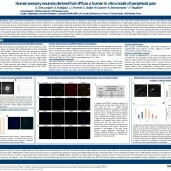 Poster SFN 2012 – New Orleans – Effect of 17β-estradiol in a long term in vitro model of central myelination: a treatment for multiple sclerosis?